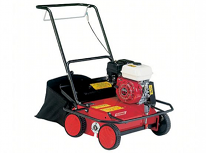 This scarifier allows moss and thatch to be easily removed from lawns and therefore allows the ground to be aerated. A low weight of 60kg and the ergonomic shape allow practical and efficient use of the machine. In order to guarantee high performance, the AR 45 has 6.5hp via a Honda engine.